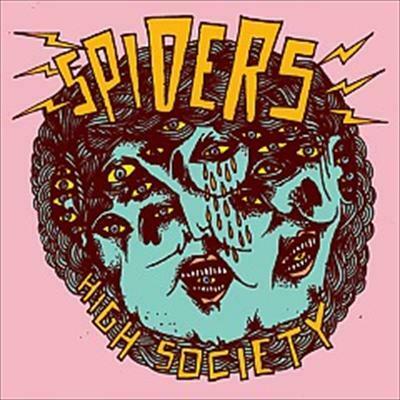 Spiders - Fraction/Under My Wheels 7"
Spiders are the Swedish band from Goteborg, Sweden that features Witchcraft/Troubled Horse guitarist and used to feature Axel from Graveyard on drums but now they have a new guy Richard Harrymon. If you are lucky, the first 75 copies of this 7" come with a limited edition 20 minute live DVD (with Axel) from Truckstop Alaska, a club in Goteborg. Anyway, the 7" starts off with Fraction. The cover of the Alice Cooper classic Under My Wheels is much faster than the original and Ann-Sofie is having to really shout the vocals rather than sing. It was ok but not nearly as cool as the original. The DVD is really well shot and edited but the sound is not that good, with the guitar far too low and just a poor definition of the sound except the vocals. It is cool to check out for the 20 minutes that it lasts and gives you a taste of the raw energy of the band. Cool release.